Gbolahan Salami, born 15.04.1991, is a talented striker, playing for Shooting Stars FC from Ibadan. Last Sunday, Salami scored two goals in the first round of the Nigerian Premier League 2010-2011. Shooting Stars FC won 2-1 against Sunshine Stars FC, the former club of Salami. The dream debut was unfortunately shadowed by incidents that should not happen on a football field. Apparently Salami ran to the Sunshine bench after one of his goals, using indecent words towards coach Gbenga Ogunbote. Some reports also states that Salami tried to attack Ogunbote and Salami is apparently suspended for two matches. Nevertheless, in this post I will rather focus on the obvious talents of one of the most exciting strikers in Nigeria, although it is a fact that he has had some disciplinary problems during his short career. The first time I noticed Salami was in the season 2007-2008. As far as I know, this was the season Salami made his first team debut for Sunshine Stars FC in the Nigeria Premier League. He did not score any goals in the league but made a good impression and at the end of the season he was named in his first squad of the Nigerian U-20 national football. Salami has been a fairly regular member of Nigeria U-20 in the time period July 2008 to October 2009, playing about 15 international matches and scoring at least 5 goals. 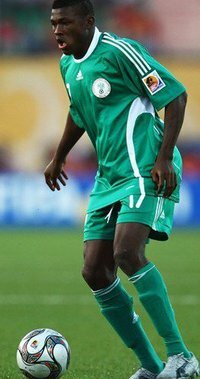 Salami was a regular for Nigeria U-20 in the African Youth Championship in Rwanda in early 2009. Salami also participated in the FIFA U-20 World Cup for his country, but had a rather peripheral role, playing only one match, where he was actually shown a red card. According to my statistics, Salami scored his first league goal for Sunshine Stars FC during 2008-2009. His goalscoring rate improved in 2009-2010, as I am able to document 3 scored goals. It is however possible that he scored a couple more. In March / April 2010, Salami was included in the squad of Nigeria B, playing both against Niger in a qualifier for the CHAN-tournament and becoming a key member for Nigeria B in the WAFU-tournament for West African B teams. In July 2010, Salami was included in a training camp for the Super Eagles, preparing for an international friendly match against South Korea. Salami did not make the final squad, but the inclusion showed that Salami obviously is on the radar of the Nigeria Football Federation. Salami joined Shooting Stars FC a few weeks before the 2010-2011 kicked off. He is expected to form a strong partnership with lanky and experienced forward Kabiru Alausa. Although Salami is mostly used as a center forward, he can also play as a winger. According to my sources, Salami is 183 centimeters, but I have also read reports indicating he is somewhat bigger. He has actually been referred to as “a towering striker”. He is nevertheless a burly, strong and hard-working striker with an impressing physical presence. His full name is Fuad Gbolahan Salami according to my sources and he is sometimes referred to as Fuad Salami. Interestingly, he calls himself Agbolahan and not Gbolahan on his Facebook-page. Salami has been linked to several clubs during the last years, including Shakhtar Donetsk and Dynamo Kiev from Ukraine, and Egyptian powerhouse Zamalek. It is my guess that he will leave Nigerian football in a matter of short time. The picture is taken from Facebook. African football had generated a lot of attention in the recent time, and still need more of exposure at the grassroots level, that is where we are. I’m kehinde Williams, Managing Diirector FUT-PRO SPORTS MANAGEMENT in Nigeria. i happen to be first manager that manage& and transfer Gbolahan Salami to Julius Berger Football Club, Lagos in 2007. Gbolahan Salami still have much to deliver for this country, He is very strong with high work rate, still very young.